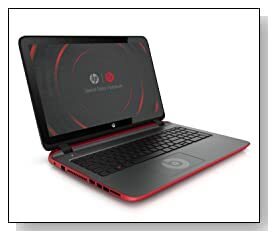 Twinkle black and vibrant red 15.6 inch HP Pavilion 15-p030nr is a new release touchscreen laptop with an optimal performance by the AMD A8-5545M processor and 8GB RAM, the graphics power of AMD Radeon HD 8510G graphics and great sound quality with Beats Audio. One of the best versatile computers you can get for the price level offering you great specs and features, solid build, great looks, a decent processor, ample storage and more..
HP 15-p030nr comes with the A-Series low voltage quad-core AMD A8-5545M accelerated processor (4MB L2 Cache) at 1.7 GHz speed- up to 2.7GHz speed with turbo boost depending on task at hand and that is an equivalent of an Intel Pentium P6100 processor, a large 8GB DDR3L SDRAM (1 DIMM) for efficient multitasking of demanding apps and handling advanced multimedia, 1TB Serial ATA hard drive at 5400 rpm as spacious storage (with HP ProtectSmart to keep your data safe) and the 64-bit version of Windows 8.1 operating system pre-installed with its additional useful features, the more familiar screen and start button option for those customers that still prefer Windows 7. 15.6 inch diagonal WLED-backlit BrightView HD dynamic capacitive touch display with 1366 x 768 pixel native resolution and AMD Radeon HD 8510G graphics with its 4224MB total dedicated video RAM (roughly equal to the performance levels of NVIDIA GeForce GT 620M) offers sharper picture quality, vivid colours and lush visuals. 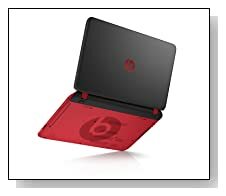 Beats Audio Special Edition with two speakers and an integrated subwoofer means crisp, high definition, booming audio (one of the best and richest laptop sound systems). HP Connected Music offers one of the world’s best music catalogues and radio playlists and smoothly integrating your music collection with major radio and music services. Front-facing HP TrueVision high-definition webcam with a built-in dual microphone eliminates background noise and makes the live chats easier. HP texture linear finish design with an ash-silver cover and Beats logo 15-p030nr laptop looks uniquely beautiful and stylish. It weighs 5.94 pounds so it is not that heavy for a 15 inch laptop with a DVD drive and measures 10.24 x 15.14 x 0.99 inches- just under 1 inch thin and does feel sturdy when you hold it, would fit in any bag and can be carried around easily. It has a full-size island style backlit- illuminated keyboard for accurate typing even in the dark or dim light, with a 10-key numpad for easier data entry and HP Imagepad that supports multiple touch gestures. The 4-cell 2.8 Ah lithium ion battery offers a battery life of up to 4 hours and 45 minutes on a single charge in average use, so it is not too bad. Connectivity options include a Multiformat DVD±RW/CD-RW SuperMulti DVD burner, an HDMI port to link to your big screen HDTV with a single HDMI cable for video and audio, 1 x Audio-out port, a Multi-format SD card reader, 2 USB 3.0 ports for ten times quicker data, audio and video transfer, 1x USB 2.0 port, 802.11b/g/n high speed Wireless LAN, Bluetooth 4.0 that enables wireless connection to Bluetooth enabled devices, 10/100Base-T Gigabit Ethernet LAN with RJ-45 connector for easy wired internet, Headphone-out/microphone-in combo jack, Kensington MicroSaver lock slot and a HD webcam.. Dragon Notes voice recognition allows simple note taking (a bit like the demo version of Dragon NaturallySpeaking). Conclusion: HP makes quality solid computers and this HP Pavilion 15-p030nr is not different, easily as one of the best laptop computers on the market for its price: It is very easy on the eyes, comes with great technical specs that allow it to run fast in many things you do on a daily basis and more complex tasks, is easy to set-up, has a backlit keyboard with a 10-key numeric pad, has an intuitive and responsive touchscreen, offers great entertainment with dual speakers and a subwoofer. Some people would still prefer the older Windows 7 and will criticise this laptop for having Windows 8 but the 8.1 version really is a shorter learning curve and the software that comes preloaded on it could be less but some of it you may still find useful. It comes with a 12 month limited parts and labor warranty including a toll-free technical and limited software support in three languages- Spanish, French and English.